A Series “Rockmaster” pumps are economical 30 or 40 cubic yard per hour concrete pumps, capable of pumping harsh pea gravel mixes all the way up to “big rock” concrete. A Series Pumps offer the best values on the market for their horsepower, pressure, and volume combinations. 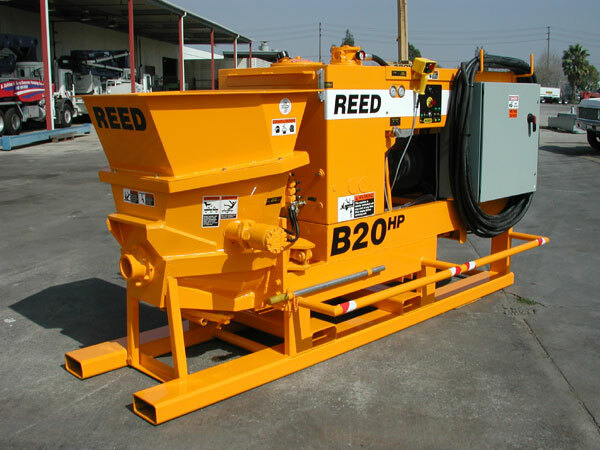 B Series concrete pumps have outputs from 20 to 70 cubic yards per hour. Commonly used for pumping concrete, shotcrete, drilling and grouting and caisson construction. These pumps feature Cummins Diesel Engines, Variable Displacement Hydraulic Pumps, heavy-duty “S-Valves”, “Open-Loop” hydraulic systems, REED Programmable Logic Controller Cycling and the strongest trailer in the industry. 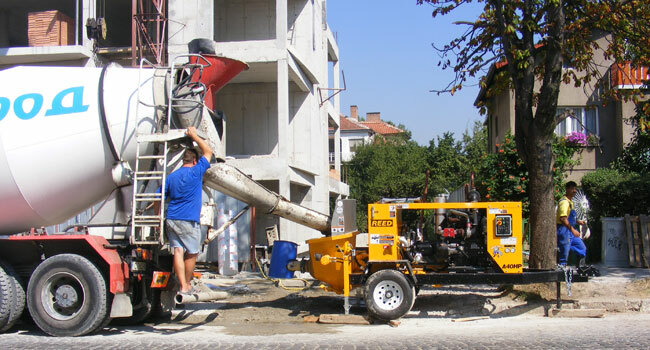 C Series concrete pumps have outputs from 50 to 90 cubic yards per hour. These Ultra High-Performance Pumps are used for the most extreme concrete pumping, high rise building construction, geotechnical grouting, tunnel construction and the highest-volume shotcrete jobs. They feature smooth-running “Closed-Loop” Hydrauli c Systems, 6-cylinder Cummins Diesel Engines (160-220hp), High Concrete Pressures (up to 2000 psi), REED Programmable Logic Controller, twin-axles, twin-shift cylinders, heavy-duty “S-Valves”, reinforced High-Pressure Hoppers (C50S and C50SS) , and Harsh-Mix Hoppers (C70S, C70SS and C90S). Mini Pumps are short, skid-mounted versions of standard REED Trailer Pumps. Ideal for applications with extremely limited space such as mining and tunnelling, or industrial applications. They can be cross mounted on trucks or other carriers.